The International Women’s Day was celebrated on 8th March 2014 in many centres of our Diocese with rally and awareness programme on topics pertaining to women in Miao Diocese. In Miao, the Women’s Day was celebrated in Government Circuit House Miao. 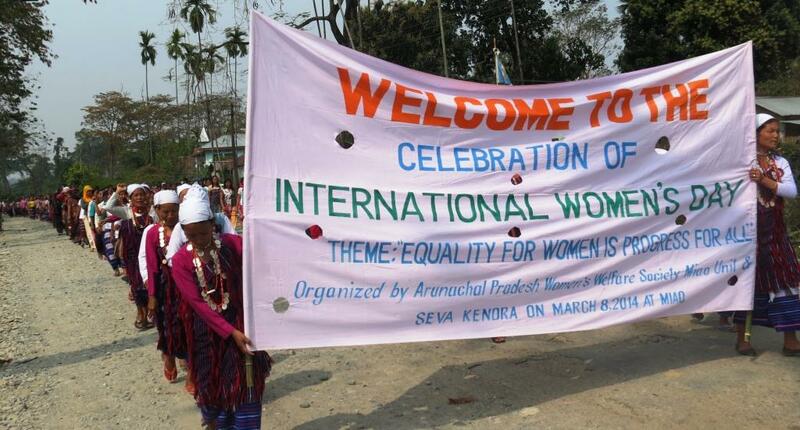 It was organized by Arunachal Pradesh Women’s Welfare Society in collaboration with Seva Kendra Arunachal East. The event began with a rally from the Jagun – Miao road and ending at the Circuit House in Upper Miao. Women gathered for the occasion came dressed in their own traditional dress, adding beauty to the rally. The theme of the day was “Equality for Women is Progress for All”. 670 women participated in the celebration. Many guests were invited to encourage the women for the celebrations. Invitees emphasized on different issues like higher education for the girl child, ending violence against women, political participation and leadership, economic empowerment, different schemes and increased the awareness in order to fight against the injustice to women. Geology and Mining minister Sri. Kamlung Mosang was the Chief Guest and he spoke about the Role of women in the family and the society. He also highlighted the need to have girl’s education. Cultural presentation from different villages made day more beautiful. Women took active part in the games organized by Seva Kendra. Similar programme was organized in Tezu, Senua and Diyun Parishes.